Summer is full of fresh vegetables that are coming from the garden, including basil, dill, peppers, tomatoes, eggplant, and many others. One of my favorite and perhaps most versatile of them all is zucchini. Zucchini comes in many variaties and can be served in many different ways. 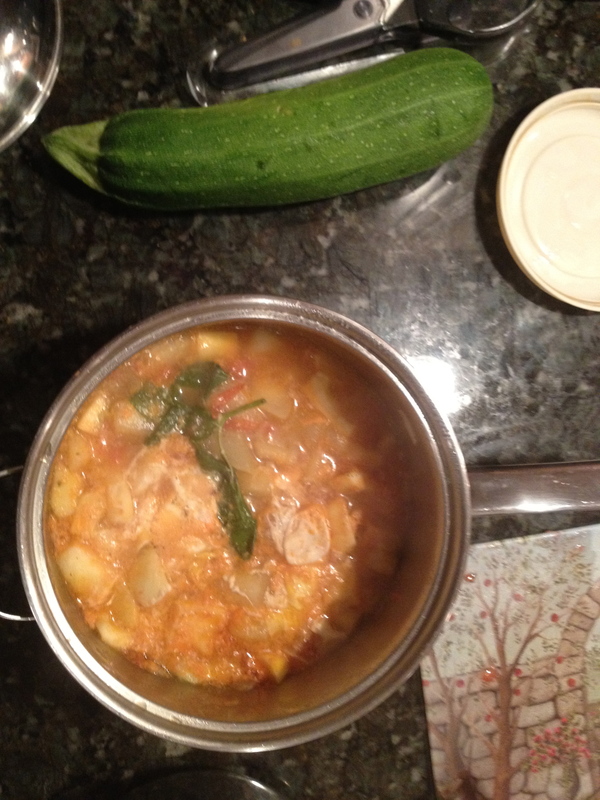 In episode 18, we share with you zucchini italiani, which is a zucchini cooked as a soup with different vegetables. We prepare it in three different ways: plain, with potatoes and with egg. You can serve it in any of the three ways or just pick one. Preferably all of these vegetables can come from your garden (or a neighbors). if not, you can use veggies from the grocery store or market. Coat a small pan with olive oil and heat. Place a quarter of the diced up onion into the pan and wait until the onion is translucent, stirring constantly. Add the diced potatoes and about a cup of water. While the potato is cooking, peel the tomatoes, take out the seeds the best you can and then cut up into small pieces, placing into a bowl. Add one of the tomatoes in with the potatoes and stir. Add salt and pepper to season. Now you will want to prepare some plain zucchini (without potato). Saute some onion in olive oil in a pan. When they are translucent, add the diced up zucchini. Add 2 cups of water as well as another sliced up tomato. Add salt and pepper to season. Cook until the zucchini is soft, which should be about 5 minutes. Once the potatoes and the zucchini are soft, you should add some fresh basil into each pan. Then take some of the zucchini and mix it into the potato mix. This is dish #1, potato and zucchini. Sepaprate the zucchini into 2 pans. One of the pans is dish #2, plain zucchini. For dish #3 (zucchini and egg), you will now add 2 eggs into one of pans with the plain zucchini. Do so while the zucchini mix is boiling. The egg with solidify and make a nice addition to the soup. In a separate pan, cook the pasta. I like to use cut up spaghetti pasta (either buy it that way or buy spaghetti and break it apart). Once the pasta is cooked up, you should mix it with the soup mixes. Of course, you can choose not to serve the soups with the pasta. Zucchini italiani ready to serve. Buon appetito! Now you are ready to serve. Simply scoop the soups into a bowl and serve hot. I always like to serve it with some fresh, crusty, white Italian bread, which is fantastic for dunking into the soup. You can also add some freshly ground parmigiano cheese if you’d like. 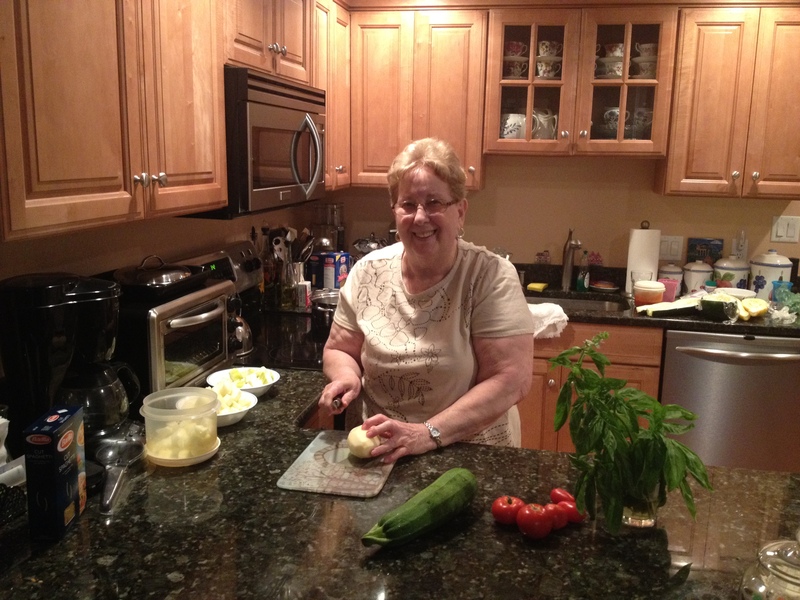 This entry was posted in Main Dishes (i secondi), Pasta (i primi) and tagged pasta, zucchini. Bookmark the permalink.